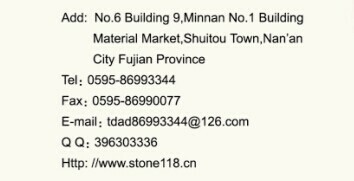 ббббThe 16th China (Nanбпan) Shuitou International Stone Fair will be held as scheduled on Nov. 8иC Nov. 11, 2015 at new exhibition halls. 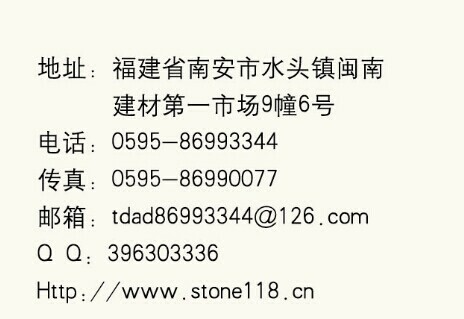 After full advice and hard work at early stage of stone industry, there will be a series of new ideas, new initiatives and new changes for this exhibition. ббббThe 55,000 square meters of new exhibition hall is adopted, so the exhibition area is expanded over the previous 3.5-fold and 2.5-fold expansion of the exhibitors. The heightening of the storey and the change of the booth area allowenriching the effect and content of the booth arrangement. The establishment ofinternational exhibition area with unified national image for Turkey, Brazil, Iran, Spain, Italy, and Spain enhances the internationalization of the fair and of the influence of the block- producing country. Also the establishment of the industry guide area allows the innovation results of high-end platforms, resource platform, stone fashion home furnishing and marketing model to have more example force. бббб1. Outdoors: outdoor media in Turkey Airport and Brazil Airport, about 10-12single column at high-speed road from Xiamen to Shuitou for 3 months dense advertisement, the single column advertisement for 3 months intensive releaseat major roads of Shuitou, and continuous release in all LED of Shuitou. бббб2. Media: salesmen in Beijing, Shanghai, Chongqing, Yunfu, and Shuitou will disseminate business information and obtain basic information for pre-exhibitionpublicity invitation, and also provide investment information at toll station exit of Shuitou high-speed road and at major bank outlets. And the cooperation withmajor industry media can publish the information of Stone Fair from time to time.The Turkish special article will be published under the cooperation withprofessional Turkish organizations and the article will be distributed to the Turkish stone industry. бббб3. Innovation Platform: the third party service provider on Wechat is applied for the enrichment of the information dissemination channels to fully release the information of Stone Fair and to replenish of the Stone Fair website. There are more than 12,000 users from the professional stone group to release the instant message can expand the influence of Stone Fair. бббб4. During the exhibition, the consulting, services, information and life strategy will be released through the information platform, Wechat, hotels and a mass of outdoor media. ббббAlthough there has been less than a month since the beginning of investmentpromotion of current Stone Fair, the booth is hard to get and there are still a large number of exhibitors can not take a booth, so the committee will actively seek the extension of temporary exhibition hall to expand the capacity. The exhibition will enhance the effectiveness of supporting activities, and organizemore match-making meetings for new stone products with designers, architectsto promote sales of new varieties. Themed forums will be held to provide direction and countermeasure guide for industry development. Therefore, we believe that under the care and efforts of all the stone industry professionals and common people who concern about the development of stone industry, thecurrent Shuitou Stone Fair will achieve unprecedented performance andfunction.